For general use, this is a good-looking, well-made stage-ready electro. Great value for money. Excellent playability. No tuner-mute or phase switch. The Takamine house was built on its electro-acoustic pickup and preamp systems. Of course, its guitars weren't too shabby either, and as well as high-line Japanese-made guitars, there are these more affordable Chinese-made G Series instruments. 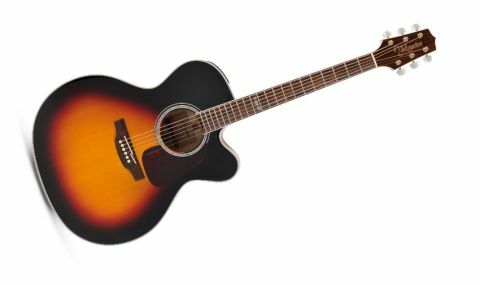 Our review sample comes from the all-cutaway electro 70 Series that includes the same-priced dreadnought, the smaller NEX, and our reviewed six-string jumbo that's paired with a 12-string (at £562). Each model is offered in both this evocative looking 'burst or natural finish. At 435mm (17.13 inches) across its bulbous lower bouts, combined with a 120mm (4.72-inch) body depth, the GJ72CE is huge. Construction centres on a solid spruce X-braced top with laminated maple back and sides, which have a subtle flame figure. "What we have is a very clean, clear and crisp high-end with a well balanced midrange and slightly tightened, defined lows"
Playability is superb. The neck has a chunky C section topped with a bound rosewood 'board with a Gibson-like 305mm (12-inch) camber and medium-gauge frets giving a familiar electric-like feel; likewise the 43mm (1.69-inch) nut width and 52.5mm (2.07-inch) string spacing across the two-piece bridge saddles. Intonation is virtually spot on; only the G string is slightly sharp at the 12th fret. String height is low, too - again, very electric-like. Sound shaping is taken care of by the three-band EQ sliders and the mid-contour switch. Unusually, there's an EQ bypass button - handy for DI recording, where you can send a flat signal in and EQ it afterwards as your track develops, all without altering your onstage EQ settings. The notch filter has a simple in/out switch and a rotary control to filter out the feedback- creating frequencies. The tuner is big and quite bright, but doesn't mute your output for silent tuning. Big-bodied jumbos don't always have the largest acoustic sounds, and here, that's pretty true; what we have is a very clean, clear and crisp high-end with a well balanced midrange and slightly tightened, defined lows. It's a superb strummer from the feel of that neck through to the balanced sound. Amplified, the EQ is broad and adequate; a little low-end lift certainly warms things up. The mid-contour switch doesn't provide a preset sound, but alters the frequency centre of either the boosted or cut midrange slider. For general use, this is a good-looking, well-made stage-ready electro. However, no tuner-mute function is odd, and the addition of a phase switch - which often cures feedback instantly - would have been welcome. Mind you, with street prices around £450, it's a little churlish to complain.